Thursday November 17 1910 I went down to Fannies to spend the day. Mother was down in the afternoon. A nice visit. Will came down town in afternoon to see the dedication of the new street car road to east Iowa City. 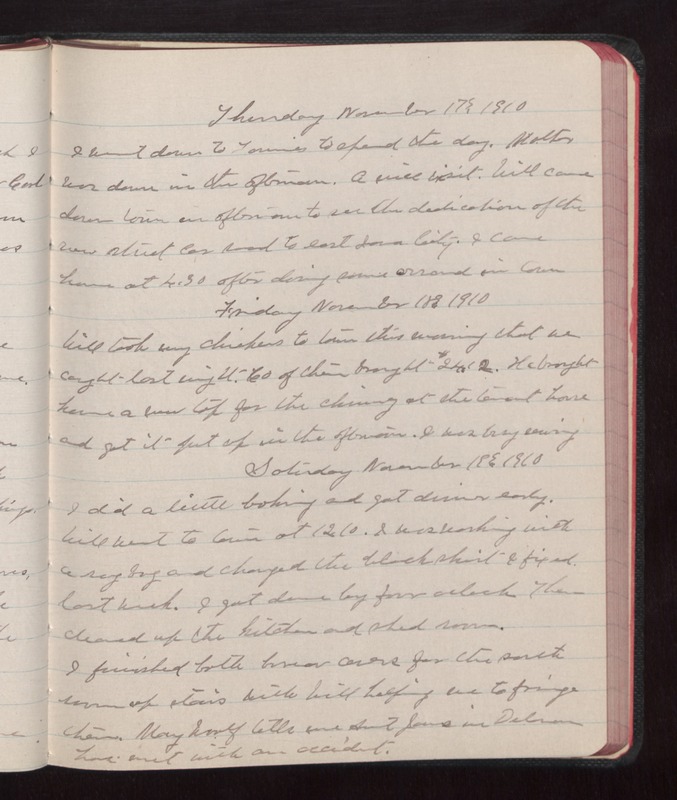 I came home at 4.30 after doing some errands in town Friday November 18 1910 Will took my chickens to town this evening that we caught last night. 60 of them brought $21.12. He brought home a new [illegible] for the chimney at the tenant house and got it put up in the afternoon. I was busy sewing Saturday November 19 1910 I did a little baking and got dinner early. Will went to town at 12.10. I was working with a rag bag and changed the black skirt I fixed last week. I got done by four oclock Then cleaned up the kitchen and shed room. I finished both [illegible] covers for the south room up stairs with Will helping me to fringe them. Mary Woolf tells me Aunt [Jones?] in [Delmar?] has met with an accident.